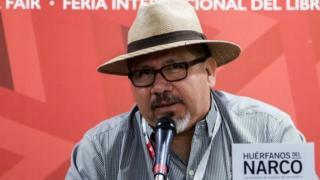 Police in Mexico have arrested a man they suspect of killing award-winning journalist Javier Valdez last year. He was shot dead in May 2017 in northern Sinaloa state near the office of the news weekly he had founded, Ríodoce. Mr Valdez wrote extensively on drug-trafficking and organised crime in Mexico, including the powerful Sinaloa drug cartel. He was one of at least 11 journalists to be killed in Mexico in 2017. Mr Valdez's widow welcomed the arrest but said it was important to know more about what lay behind it. "If they can demonstrate that this is really the killer... we'll need to know why he did it, what the motive was and who gave the order," she told Agence France Press news agency. "I hope it will be soon," she said. The arrest was announced by Mexico's Interior Minister, Alfonso Navarrete, who did not give any further details about the suspect. Ríodoce reported that the suspect was a 26-year-old cartel member known by the alias of Koala. According to the news weekly, the man was arrested in the border town of Tijuana while driving the car used by the gunmen who shot Mr Valdez. Mr Valdez was well aware of the risks he war running by covering the drugs war in a state wracked by drug-related violence. Speaking at a launch of his book Narcojournalism he said that being a journalist "is like being on a blacklist" and that gangs "will decide what day they are going to kill you".